If there was one aspect of the Cubs’ 2016 performance that was almost certain to regress, it was the historic .255 BABIP allowed by the pitching staff. That mark was the lowest since the last round of expansion in 1998 by a clear margin, beating the 116-win Mariners of 2001 by 5 points, and the last team to have a better BABIP was the 1982 Padres. In fact, relative to league average, the 2016 Cubs had the lowest BABIP allowed of all time, at 43 points lower. While the fielding was stellar, many anticipated that the level of luck required to produce such a record was unsustainable. That regression has taken place to some extent: the pitching staff’s BABIP this year is .281, 15 points better than league average, both a significant move back towards the mean and still distinctly better than the majority of the league. Chicago doesn’t lead the league this year; first place is held by the Dodgers, at .279. For those who are intimately familiar with the rotation’s batted ball statistics (time well spent, right? ), the fact that the Cubs are well above-average might still come as a surprise. After all, Jon Lester’s BABIP is an unremarkable .304. After years of demonstrating the ability to induce poor contact, Jake Arrieta is running a .311 BABIP. John Lackey’s .269 is on the right side of .300, but at least a small part of that is down to the fact that many of the well-hit balls against him are simply leaving the yard. Kyle Hendricks is doing normal Kyle Hendricks things with his .259 BABIP, but that hardly seems enough to carry the staff to an almost league-leading level. That’s because it isn’t. BABIP for Cubs starters collectively is .291, just six points better than league average and not even top ten in the league. Instead, it’s the bullpen which has continued the trend of 2016, sporting a .264 BABIP, 30 points better than the league average for relievers. Every single reliever on the staff with at least 20 innings this year has been average or better; Pedro Strop has the second-highest mark of the group at .275. Carl Edwards has somehow improved on a .162 BABIP in 2016, sitting at .161 so far this year. His career BABIP of .169 is currently the best of any reliever in MLB history by an incredible 41 points. The unit is in fact almost exactly replicating its performance of 2016, when it produced a .262 BABIP. Over the past year and a half, a period in which the Cubs bullpen has pitched 730 innings, the bullpen has had a BABIP 32 points better than league average, and 13 points better than the second-placed Dodgers. Their batted ball success has helped them to a bullpen ERA of 3.28, fourth-best in the league. As entertaining as it is to marvel at this absurd outlier performance, there’s a more fundamental question to be answered here: is there any reason to expect this to continue going forward? 730 innings seems like a decent sample, but there’s a lot of noise here. BABIP takes around 2,000 balls in play to stabilize for pitchers and while the sample covers over 5,000 BIP in total, many of the individual pitchers are nowhere near that mark. The defense is one key factor, and the picture isn’t as clear this season. In 2016, all metrics seemed to agree that the Cubs were comfortably the best defensive team in the majors; this year, while DRS still has Chicago at the head of the pack, UZR is far less confident, although it still considers them an above-average defensive team. It’s clear that the Cubs do creative things on the defensive side in addition to having elite defenders such as Jason Heyward, both of which should help them turn more balls in play into outs. It would hardly be surprising if the demotion of Kyle Schwarber helped even further on that front. However, if it was just the defense again, we might expect to see more impact for the starters too. Let’s take a closer look at the individual relievers and some of the batted ball data that might indicate just how much of their success is down to fortune. Here are the seven most-utilized bullpen arms with their 2017 BABIP & soft contact percentages (per Fangraphs), xBABIP from Andrew Perpetua’s excellent Statcast-based xStats, and their expected batting average and expected wOBA data from the Statcast system itself. Edwards’ high spin fastball and how difficult it is to make good contact against has been well documented on these pages, as has the effectiveness of the curveball he throws to Tapia here, but this is a clear reminder that no matter how good you are, sometimes you need help from your teammates. Aside from confirming what we might have suspected about Edwards and his historic batted ball performance, this data does suggest that Chicago’s bullpen BABIP is not a fluke. The xBABIP league average is, as you’d expect, .300, and none of these seven relievers are close to that. What’s more, xBABIP doesn’t incorporate shifts yet, so it’s reasonable to expect slightly lower marks than those shown here. While Edwards, Justin Grimm, Koji Uehara and Wade Davis have all outperformed these expected metrics to varying degrees, none of them qualify as bad by any stretch of the imagination. The league average BA for relievers is .241, ten points higher than even the worst of these xBA marks, and the same goes for the league average wOBA of .321. There’s also a real case to be made that Hector Rondon, Brian Duensing and Strop could be expected to improve on balls in play going forwards if they keep pitching as they have been. Davis, Edwards and Grimm are all in the league’s top 30 relievers by strikeout percentage. Uehara’s swinging strike rate is over 15 percent. It’s a formidable collection of skills even before considering the batted ball data. 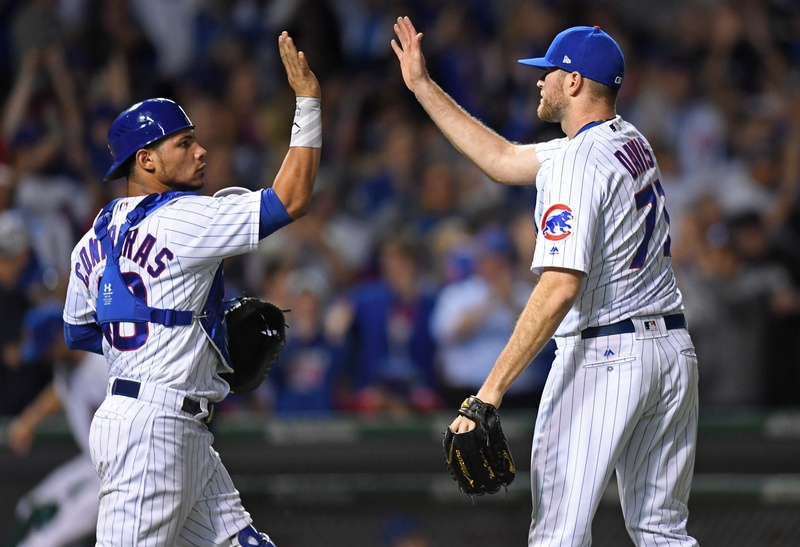 As a whole, the Cubs relievers rank perfectly respectably in numerous key metrics: sixth in strikeout percentage, eighth in K%-BB%, eighth in swinging strike rate. The fact that all of their relievers seem to be able to induce poor contact at an above-average rate, coupled with the excellent glovework behind them, points to this particular statistical quirk continuing at least through 2017. Chances are that batted ball fortune will turn their BABIP performance from remarkable into merely great, but it’s fair to say that this unit is not simply relying on luck. Darius is a Giants fan from the UK, a strange combination which arose out of an interest in fantasy sports and Tim Lincecum. He also enjoys reading, castles, mountains, and Mario Kart 64. This is an outstanding article, kudos. I can’t wait for Edwards to be our closer for the next 5-6 years.